This article is a follow-on from my previous two published in Archaeology Ireland Summer 2005 and Spring 2010. The first article discussed my hypothesis that a group of Insular artworks from the 8th/9th centuries represents various parts of a men’s hopping dance that would seem to have survived into the 20th century amongst the farmers of Wyresdale in northern England. My second article began to address the possible context for this dance and how it came to be represented on objects of the highest status and sacred significance. I looked at the possibility that the dance was special to a school of craftsmen whose ritual and lore eventually gave birth to Freemasonry. The evidence is certainly intriguing and perhaps beyond coincidence. If a precursor to Freemasonry was present in 9th century Ireland then it is likely that it had come from the East with Christianity. Masonic ritual and lore involve Old Testament topics like Noah, The Tower of Babel, and Solomon’s Temple. I began to suspect that the dance was revered because it had come from the East with a group of craftsmen and was already very ancient. With or without graphic illustrations, the dance could easily be transmitted by demonstration. If in addition, senior high status craftsmen told the story of its ancient origins, the dance would easily have been accepted into the Irish world of bards and musicians. In their book “The Celtic Realms”, Dillon and Chadwick ,1967, say that, considering the relatively sudden appearance of Irish high crosses with no apparent evidence of the evolution of the stone sculptor’s craft within Ireland, ”the origins of the high cross, as of the stele, are to be sought in Mediterranean Christian lands, Armenia or elsewhere in the Byzantine Empire where political upheavals like the Arab conquest and the Iconoclastic Controversy must certainly have driven many expert artists into exile”. I didn’t have to look hard for an eastern lead to follow; once again Franςoise Henry had already provided it in her book “Irish Art during the Viking Invasions” where she compares an eastern pattern with a group of patterns from Ireland (fig 1a). This eastern pattern is a bronze from Luristan in the Zagros Mountains between Iran and Iraq. It not only leads us to the East but a further 2000 plus years back in time to the early days of Luristan bronze production. The artefact has been described as “A bronze standard showing a roundel of water deities which could have been used as a ceremonial object in household shrines”. 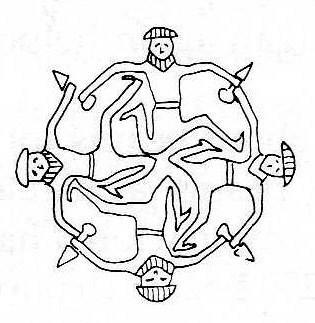 A friend pointed out two other similar roundels featured in a book “Mari and Karana, Two Old Babylonian Cities”, by S. Dalley , 1984, and I found another referred to in “Mesopotamian Art” by Anton Moortgat,1969, (see fig1 b, c and d). All the artefacts involved are from roughly 2000BCE to 1500BCE. Clearly, for four examples of this type of pattern to have survived, the composition must have been widely known in the Middle East. 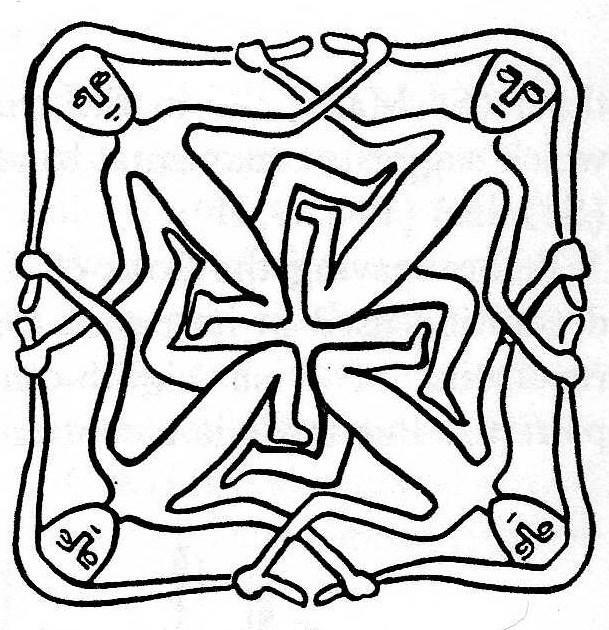 Whilst the patterns don’t appear to represent a hopping dance, they do show four linked men dancing in a circle and they have many constructional features in common with the Irish four-man examples (fig 1e, f, g). If there wasn’t such a large time and location gap, I wouldn’t hesitate to say that the artists were connected in some way. If there is a connection and the Eastern patterns represent a craft association’s ritual dance which survived for 2000+ years and found its way to Ireland, why did it cease to be represented in this way? Was it perhaps only represented on perishable objects which haven’t survived until today, or did ceremonial bronze or stone objects carry the art style forward? Perhaps the Togherstown bronze (see my first article in AI Summer 2005) came from the East. Figure 2 While I was wrestling with this conundrum, another Eastern pattern in Anton Moortgat’s book came to my attention (fig 2). It was found by W.Andrae whilst excavating Old Babylon and is now in the Berlin Staatliche Museum. This pattern carved on a marble disc is so relevant to my quest that I can hardly believe it. I look though book after book on world art searching for patterns of interest with no success and then this turns up and where does it come from? Old Babylon ----the Epicentre of Masonic lore and legend with a huge presence in the Old Testament! 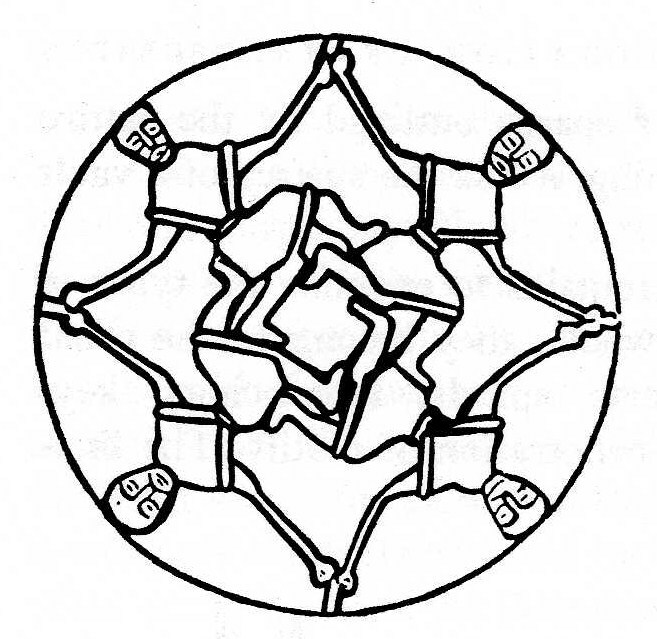 On the downside, there are five men in the pattern, not three or four, but they form a neat pentacle which is nicely appropriate to Masonic and sword dance connections. The constructional method is otherwise very similar to that of the other Eastern and Irish/Scottish examples. The 90deg twist of the waist to have the torso enface is in common with the other Eastern examples and Old Kilcullen and Ahenny (figs 1e and 1g). 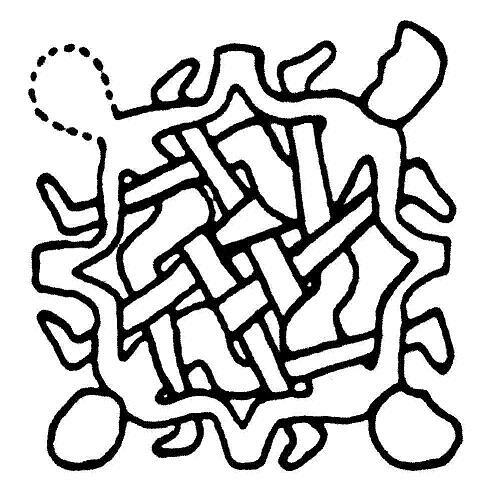 Having made previous hopping dance interpretations, I can read this pattern very clearly (although there is some ambiguity or a mistake in the weaving of the legs which I shall come back to later). 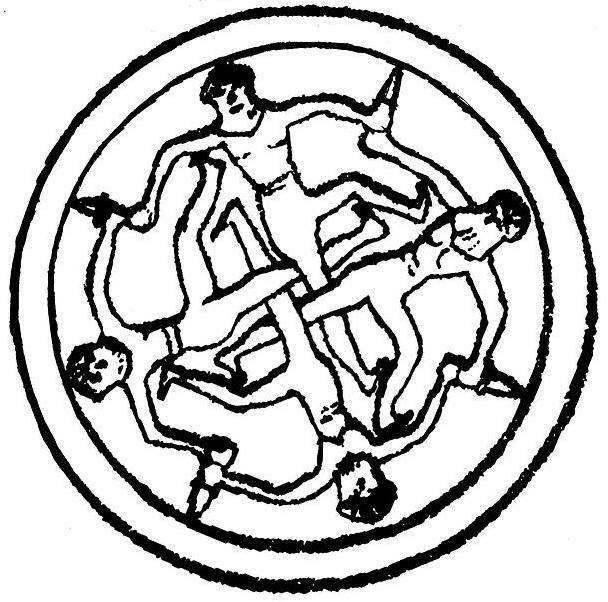 Five men stand facing into a circle and each man puts his left leg through the crooked left arm of the man on his left thus forming an interlocked basket in which they can hop round. This is not an easy figure for average persons to perform because it requires gymnastic or balletic ability. An experiment to show that it is quiet feasible was conducted at the Royal School of Ballet in autumn 2011 and the result is shown in Fig 3. 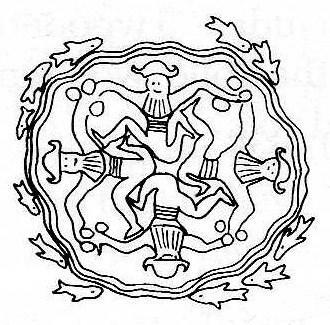 One feature of the pattern that is a strong indicator that it represents a hopping dance is the way that the artist has resisted putting right ankles through the crooked right arms. If this was simply a two dimensional interlace for decoration this would have been an obvious thing to do. In its simplest form, the hypothesis that I now put forward is that a dance genus that was known in Old Babylon survived in vestigial form into the 20th century in Northern England. This ancient dance, like many others, may have been disseminated widely and evolved into many different forms which would have survived with mixed success. The evidence that I have presented for this single thread of survival is intriguing but a gap of 2000+ years, even considering the distinctive nature of this dance and its association with secret brotherhoods, seems almost too unlikely to contemplate. My attempts to fill the 2000+ year gap have mostly been disappointing. I have found no surviving graphic representations from the period and the difficulties of dance description and historical linguistics don’t help. One book that I read with eager anticipation, however, was “The Sacred Dance” by W.O.E.Oesterley, 1923. The scholarship therein is extensive, tantalizing and very relevant to this subject but I found little that I would present here as evidence. 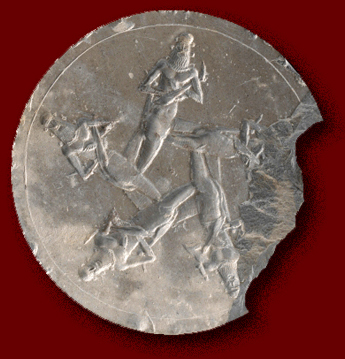 Under the heading of “Ecstatic Dance” he mentions the dance of the Prophets of Baal when they performed a limping dance in their contest with Elijah (1 Kings 18:26). In a recent book (“Life in Biblical Israel”, Stager and King, 2002) the word for limping is reinterpreted as hopping and it states that a “hopping dance designates a ritual dance”. This fits in neatly with my hypothesis because the Baal-worshiping Phoenicians and in particular the Tyrians, were renowned for their craft skills which suggests that powerful guild-like organisations were present. Incidentally, the Phoenicians had a god of dance called Baal Marquod. The 20th Century Wyresdale Greensleeves Dance that gave birth to this investigation could not be described as ecstatic but in the past the spinning/hopping figures might have had some relationship to the Whirling Dervish ecstatic dance. A century or so before Elijah, Solomon asked Hiram King of Tyre for craftsmen and materials to help build his temple. The murder of the Tyrian master builder Hiram Abif during the construction of the temple is a central scenario of Freemasonic Ritual. If there is some truth in this story, the ritual may have developed among the Phoenician craftsmen in Israel and the Baal-worshipers’ ritual hopping dance may have been an accessory. Building a temple to Yahweh would have been at variance with the Baal worship of their home country and a reason for secrecy. For some time I contemplated visiting Luristan in the Zagros Mountains to see if the nomadic Lur tribesmen had maintained any relevant traditional dances but with the present Middle East political situation it seemed unwise. Around this time a friend suggested that I should read “Meetings with Remarkable Men” by G.I.Gurdjieff and he lent me his copy. G.I.Gurdjieff was born around 1870 and died in Paris in 1949. He was born in Alexandropol and brought up in Kars in Eastern Anatolia. I can’t begin to write an adequate profile of the man in this article. I would suggest Wikipedia as a starting point for further enquiry. The following is the briefest possible summary of his significance to my study. G.I.Gurdjieff spent many years travelling in a search of ancient esoteric teachings and he claims to have visited a remote monastery somewhere in the Transcaucasian region where he learned, among other things, some sacred dances. After reading “Meetings with Remarkable Men” I read his major work “Beelzebub’s Tales to his Grandson” and when I came to the chapter on art I was astonished. He doesn’t state it as fact, but he says that a brotherhood in Old Babylon designed many things including sacred and secular dances that would survive in human culture for many generations. So, I have traced a dance back 3800 years to Old Babylon and here is Gurdjieff saying that a group of Babylonians were sending dances to the future. I have found some strange coincidences in this investigation but this takes the biscuit even if Gurdjieff’s story is a total fabrication. Gurdjieff, his writing and his teaching are a huge enigma and many academics dismiss him as some sort of charlatan and yet he has thousands of devotees and his web-presence is massive. I can only hope that my “find” can cast some light on his teachings. In Peter Brook’s film of “Meetings with Remarkable Men” from 1979, two temple dances done by men are featured. They are not like my hopping dance except in as much as they are very strange. In “Beelzebub’s Tales to His Grandson” Gurdjieff says that the Babylonian brotherhood that launched these things (that he terms “legominisms”) in to the future, made models of them which were discussed at their meetings. He also says that knowledge would be transmitted to the future by means of “lawful inexactitudes” in their various productions. Does this have anything to do with the ambiguity/mistake mentioned above? Could the Babylon disc be a model for discussion? From the start of this investigation 18 years ago, I was conscious of the potential significance of the Isle of Man’s 3 legged symbol which has abstract cousins amongst examples of Insular trisceles. The Island is so geographically central to the Dark Age period of this study that it is inevitable that the hopping dance would once have been known there. The Island had a linked sword dance called The White Boy’s Dance that survived as a tradition until the 1890s but nothing similar to the Wyresdale Greensleeves Dance from Lancashire that initiated this study. The problem is that there are other places that use the 3 leg symbol so are they all related to the hopping dance? The town of Fϋssen in Bavaria uses the symbol and, as in the Isle of Man, the origins are unknown. The town was built around the 9th C Monastery of St. Mang or Magnus who is reputed to have been a follower of the Irish monks St Gall and St Columbanus. Thus it was connected with the Irish monastic network that could have transmitted the hopping dance to here as well as to Bobbio (see my first article in AI Summer 2005). 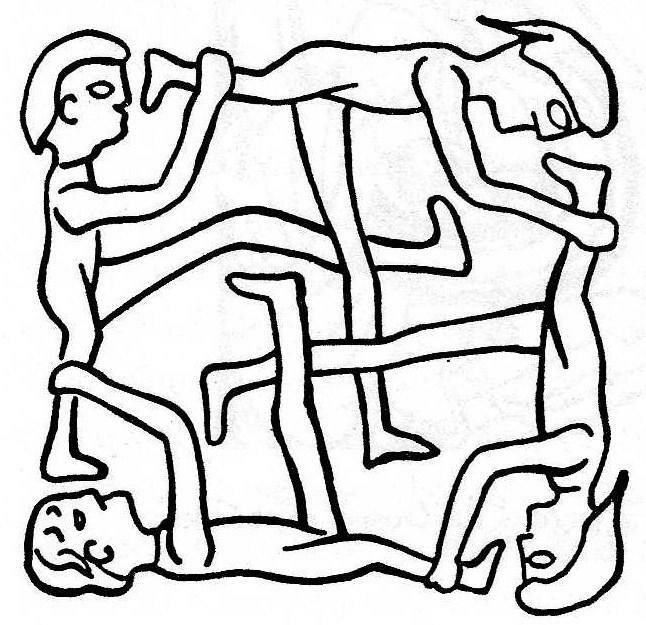 A seemingly tougher challenge is to explain how the symbol came to be depicted in a 3rd C BCE mosaic in Sicily. It seems too straight forward to say that, if the Phoenicians knew the hopping dance, it would certainly have been taken to Sicily, but perhaps it really is that simple. In Ireland, carvings of the hopping dance are clearly associated with Christ. Many historians have speculated about Jesus’ profession before he started his ministry. Was he a craftsman like his father? If he was a craftsman perhaps his craft guild became proud to be linked with him as Christianity became a major religion. The guild’s traditional dance then became sacred by association. Imagine the 17th century Guild of the Perth Glovers and Skinners with their traditional sword dance that they performed in front of King James. The dance was the public face of the organization. How would it be regarded if, a couple of centuries later, one of their members became accepted as the Son of God? In conclusion, where does all this “evidence” and speculation leave my hypothesis? I started with a modest shepherd’s dance and it led me back to Old Babylon. Along the way I tried to shun anything nebulous and stick with the facts or artefacts whilst trying to avoid bias towards a long term survival assumption. I have become convinced of the importance of apprenticeship in the development of civilization. Crafts and technologies can only advance with long term continuity and this depends on the basic imperative for parents to get their offspring into jobs whereby they cease to be a burden and can look after them in old age. An association with this process seems to have given the dance a long life. The “reconstruction” that I have put together in the style of the Wyresdale Greensleeves Dance can be seen on youtube as “Wyresdale 3 kick”. The Book of Kells Figure and the Babylon figure are left out because they require fitter dancers! I think a version like this may have existed in the late medieval period but in earlier times, when the dance still had a sacred or ritual context, the nature of the dance may have been quite different. If the rustic dance of the Fer Cengail is part of this history then the dance may have gone through a sacred to secular transition after arrival in Ireland. I suspect that the kicking content was introduced at this time or later. I hope to learn more about the potential of the dance genus with the help of the staff and pupils of the Royal School of Ballet during 2012. When, in my career as an engineer, I wrote a technical report, I was expected to give the reader an estimate of my confidence in my conclusions, since, having read up on the subject and carried out tests etc. I was “the expert”. Accordingly, I would say that I am 90% sure that a ritual hopping dance that involved small numbers of men linked in circles existed in 8/9th century Ireland and that it was done by a school of craftsmen that evolved into the Freemasons. I am 90% sure that it came from the East in the wake of Christianity. I am 30% sure that it came from Old Babylon and 5% sure that it was the dance of the Prophets of Baal (all 450 of them). If anyone has an alternative interpretation, I would be interested to hear it. To quote Professor Morton Smith, “Historians usually find what they are looking for- a fact that makes me uneasy”.